The Conservation Training Partnerships Program was selected as the recipient of a 2018 DataHaven Innovation Award (Data in Education Award – University and Graduate Level). 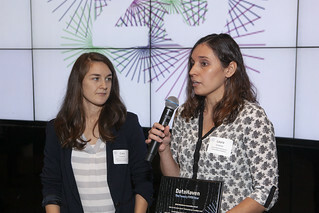 The awards, presented by Liberty Bank Foundation, were designed to highlight the creativity and ingenuity of individuals and groups who employ data to make Connecticut a better place. Team members with a CAHNR Center for Land Use Education and Research or Department of Natural Resources and the Environment affiliation include: Extension Educator Chet Arnold, Associate Cooperative Extension Educator, Cary Chadwick, Visiting Assistant Professor Laura Cisneros, Associate Cooperative Extension Educator Dave Dickson, Visiting Assistant Extension Educator Jesse Rubenstein and Vice Provost and Professor John Volin. This entry was posted in Environment, Events, Extension, Faculty, Stories. 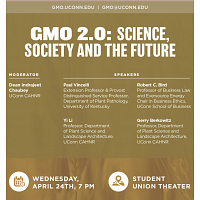 Sign up here to receive a weekly wrap-up of stories we run here on Naturally@UConn. 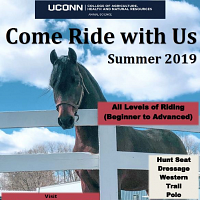 Come ride with us in the UConn Summer Riding program! Lessons available in several disciplines for all levels! 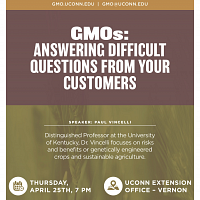 Dr. Paul Vincelli will give a presentation for farmers on answering difficult questions about GMOs and other science related topics. 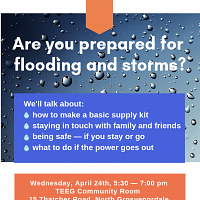 There will be plenty of time for questions and answers.